We house professional baby scales so you can check the weight of your beautiful baby or even measure baby’s intake if you’re concerned about weight gain. Call us to insure we have one available for in-store use. Our scales are also easily rentable to use comfortably in your own home. We want the scale to be a beneficial tool to help you overcome hurdles. Please discuss any weight concerns with your doctor or speak to our on-staff IBCLC board-certified consultant. The BabyWeigh scale allows you to measure the amount of milk your baby consumes during breastfeeding, simply by weighing your baby on the scale before and after the feeding. Weighing infants before and after a breastfeeding to measure the amount of milk consumed is known as “test-weighing.” The “before” weight is subtracted from the “after” weight to determine the amount of milk consumed. For test-weighing to work accurately, a baby must be weighed in exactly the same clothing and blankets before and after the breastfeeding, so that only the milk intake is “different” between the two weights. The BabyWeigh scale will display the difference between the “before” and “after” weights in grams. A special feature of the BabyWeigh scale is that it automatically subtracts the “before” from the “after” weight, and displays this calculation in an easy-to-read digital format. 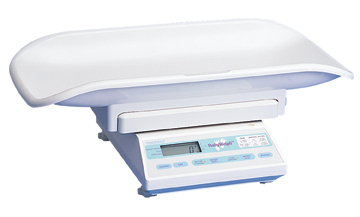 Additionally, the scale is lightweight, portable, and easy to use. 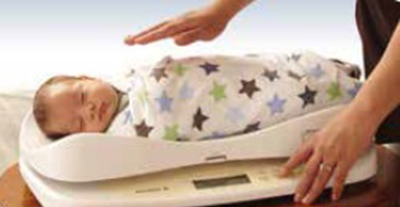 The BabyWeigh Scale provides accurate measurement of baby’s weight just before and just after breastfeeding. The difference between these two weights equals breast milk intake. This guides you as your baby continues to grow so you can track how much milk he/she is taking in. 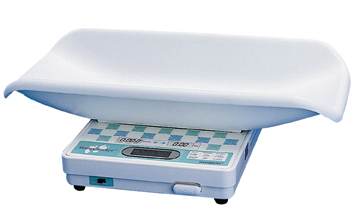 The BabyWeigh Scale assists parents with breast milk intake for infants up to 44 lbs. This scale uses a transformer. As a safeguard, you should place one hand just above, but not resting on, your baby at all times when your baby is on the scale. Then, if your baby should move or twist suddenly, you could use your hand to steady your baby. Under no circumstances should you ever place your baby on the scale and turn or step away. The BabyChecker gives an electronic measurement of baby”s weight up to 20 lbs, (10 kg) and toddlers weight up to 40 lbs, (20 kg). The BabyChecker is powered by 6 AA batteries. This scale does not use a transformer. It is lightweight, portable, and baby’s movement won’t affect the accuracy of the scale. Please call or stop in to find out more about our scale rental policies and prices.